Launching today is the bulk of the Radeon 300 series, the so-called “numbered” parts like 390, which are categorically distinct from the Fury products. As we mentioned in the introduction, from a volume standpoint these cards are the backbone of AMD’s lineup and will be where the majority of their sales take place. The attention may be on Fiji as AMD’s newest and fastest part, but it’s here where AMD makes the most in sales. To cut right to the chase then, for better or worse all of the numbered parts – 360, 370, 380, and the 390 series – are refresh products based on existing AMD GPUs. The only new GPU AMD is launching for desktop video cards is Fiji for the Fury parts, which leads us to the current situation. Since the launch of the original GCN 1.0 cards in 2012, AMD has gone about refreshing their lineup in an unusual piecemeal fashion. All-told AMD has launched three new desktop GPUs in the last two years – Bonaire, Hawaii, and Tonga – and next week Fiji will make number 4. So AMD hasn’t stayed idle since 2012, but because they’re releasing 1-2 GPUs a year each year, they none the less end up releasing refresh products such as is the case with the 300 series. Along these lines, because AMD is not releasing new GPUs in this range, the company is also forgoing releasing reference cards. Reference cards were built for testing/promotional purposes, but all of the cards being launched today will be fully-custom cards tailored to the 300 series specifications, a number of which will be similar to existing 200 series cards. This means AMD’s partners are offering a significant variety of cards right off the bat, a pure virtual launch, as it is sometimes called. However because AMD isn’t producing any retail reference cards they have also opted to not pre-sample the press ahead of time for reviews. And while we’ll be looking at partner cards over the coming weeks, for today’s launch we do not have any cards or benchmarks in hand, and for the immediate future our focus is going to be on Fury. So with that out of the way, let’s get started on AMD’s new Radeon 300 series lineup, starting from the bottom and working our way up. At the bottom of the 300 series stack is the R7 360. This is a cut-down Bonaire based card featuring 12 of Bonaire’s 14 CUs active, for a total of 768 SPs. This part is essentially the replacement for the R7 260, which was similarly a cut-down Bonaire based part. Like the other refresh cards in the 300 series, the R7 360 pushes the envelope just a bit harder to offer an incremental improvement in performance over its predecessor. AMD has turned up the GPU and memory clockspeeds slightly, from 1000MHz/6Gbps on R7 260 to 1050MHz/6.5Gbps on R7 360. Both the GPU and memory clockspeeds essentially close in on the gap between this card and AMD’s top tier Bonaire card, R7 260X, so everything here is within what we’ve seen the best of Bonaire designs do before. At a typical board power (TBP) of 100W, R7 360 is spec’d to draw just a bit more power than its predecessor, in line with its clockspeed increases. 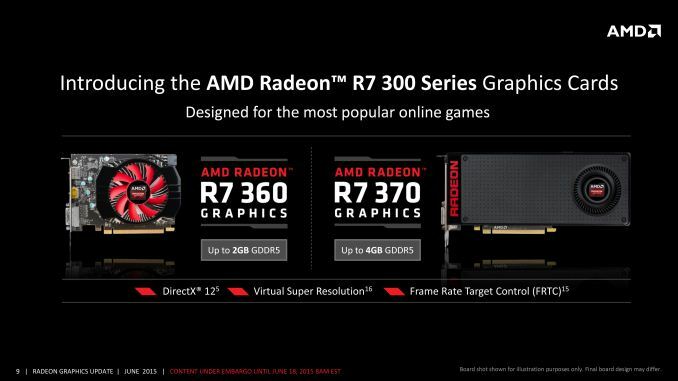 Meanwhile AMD is telling us that we should see cards with 2GB of VRAM, and from the product lists I’ve seen in advance I’m expecting that this will be the default, at-MSRP configuration for this product. And with an MSRP of $109, it will be a drop-in replacement for the R7 260 from an MSRP standpoint. Finally, as AMD’s entry-level video card, expect to see AMD targeting this at budget buyers and/or MOBA/F2P gamers. Both AMD and NVIDIA are well aware of how much money DOTA2, League of Legends, and other games within that space have been able to pull in, and they want a piece of that pie themselves. All of these games are designed to be able to run decently on iGPUs, so the company’s marketing focus is on being able to play these games at higher framerates with better image quality. Up next is the Radeon R7 370. Based on AMD’s venerable Pitcairn GPU, this card is essentially a rework of the R7 265, AMD’s sole cut-down 16 CU (1024 SP) Pitcairn card in the 200 series. Compared to the R7 265, the R7 370 sees a 5% GPU clockspeed bump, up from the R7 265’s 925MHz boost clock to an “engine clock” (and what we’re assuming is a boost clock) for the R7 370 of 975MHz. Meanwhile memory speeds remain unchanged at 5.6Gbps, which after AMD’s Pitcairn board rework for the 200 series, is about as much as Pitcairn’s memory controllers are up to the task of driving. Perhaps the most interesting change here is that AMD’s official TBP is spec’d for 110W; this is sharply lower than the official 150W TBP for the R7 265. Truth be told I question whether this number is grounded in reality – even with some hearty BIOS-level optimizations, that’s a 26% reduction – but we’ll have to see what the retail cards are like once we can get our hands on them. The big issue for R7 370 right now is that Pitcairn is venerable, but it’s also old. It’s the one GCN 1.0 GPU in the 300 series, and that means it lacks all of the feature updates and optimizations that have come since then. Consequently compared to newer products it doesn’t feature fine-grained clockspeed domains, support for Freesync or True Audio, support for decoding any video over 1080p, nor does it possess performance optimizations like delta color compression. Pitcairn continues to be a workhorse for AMD in large part because it does its job so well, but the differences between it and the newer GCN GPUs become more readily apparent with each generation. Along with lacking Freesync support, it’s also the only GPU in the 300 series lineup not to support DirectX 12 feature level 12_0 (instead it’s an 11_1 part), so while none of these feature deficits are deal-breakers, it does none the less highlight the fact that like the workhorses that have come before it (e.g. G92), Pitcairn is on its last generation. Anyhow, AMD’s specifications call for the R7 370 to be offered with both 2GB and 4GB configurations. Based on the early pricing we’ve seen, it looks like the 2GB card will be the common configuration, with 4GB being an option, though less likely. Expect to see 2GB cards hit the market at $149, the same price as the R7 265 before it, with 4GB pricing around $169. 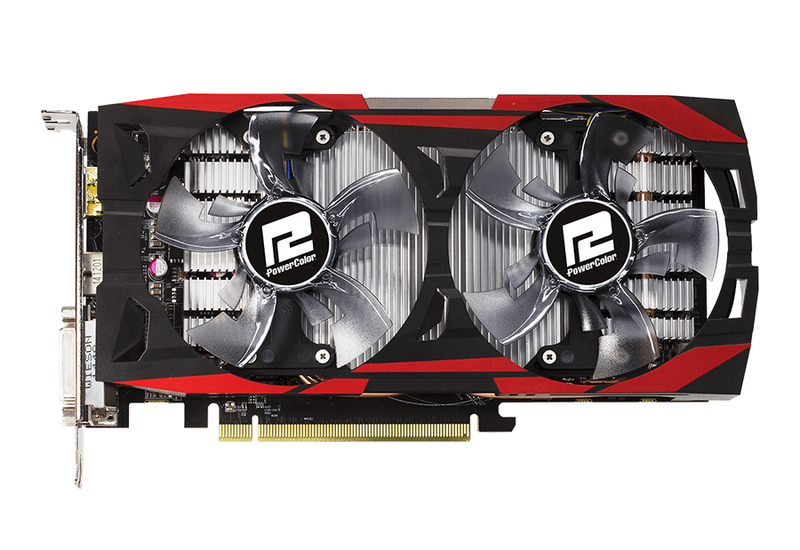 Going up the ladder once more, we have the R9 380. This card is based on AMD’s Tonga GPU, their first GCN 1.2 GPU, and is the descendant of the R9 285, which was launched back in September. Like the other cards in today’s launch, the R9 380 has seen a spec bump compared to its predecessor. The boost clock is up by about 6% from 918MHz to 970MHz, and the memory clock is unchanged, holding at 5.5Gbps. No other changes have been made, and the other specifications such as the number of CUs (28), the number of ROPs. (32), and the number of memory controllers (4) remains identical to R9 285. Update 06/18: We have since corrected the memory clocks for the R9 380. 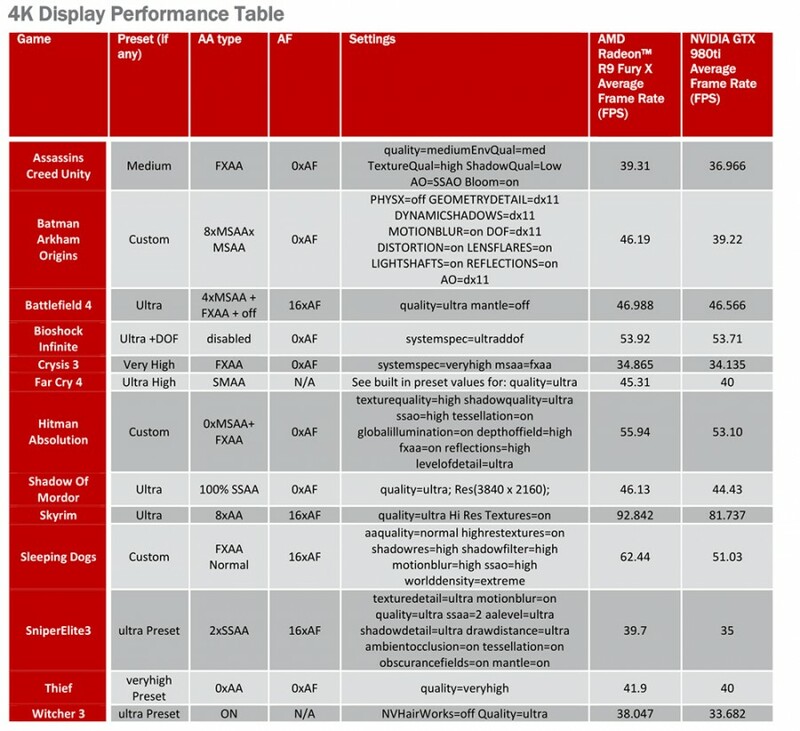 AMD's marketing material lists two different values; 5.5Gbps and 5.7Gbps. The original guide we based our information on listed just 5.7, so that is the original value we used. As we always list the minimum specifications for a product, we have corrected this to 5.5Gbps. Our apologies for the confusion. Unfortunately this also means that we’ll be waiting for another day to see what a fully-enabled Tonga would be like. AMD has to date not shipped a fully enabled chip; it has since become clear that Tonga does in fact have 6 memory controllers (for a 384-bit bus) as opposed to the 4 we see active here, and on the desktop in particular we’ve never seen a part with all 32 CUs (2048 SPs) enabled. The closest thing to a full Tonga remains the R9 M295X in the Apple iMac. Despite being the oldest of the GCN 1.2 chips, Tonga for now also remains the most mysterious. Moving on, compared to the R9 285 the TBP of the R9 380 holds at 190W. Whatever power optimizations AMD has been able to make have essentially been consumed by the clockspeed increases. In the 300 series lineup this makes the R9 380 AMD’s premiere sub-225W card, as these cards can be driven by a pair of 6-pin connectors, or on more forward-looking models a single 8-pin connector. As far as memory configurations and pricing goes, like the other 300 series cards, R9 380 gets an optional memory bump. The base MSRP of $199 is for the 2GB card, while you can expect to see 4GB cards for $219-$229 or so. Since AMD’s partners are also offering 4GB R7 370s, a 4GB R9 380 is not all that surprising, and it gives buyers an option for a card that's going to be a little more future-proof than a 2GB card in 2015. 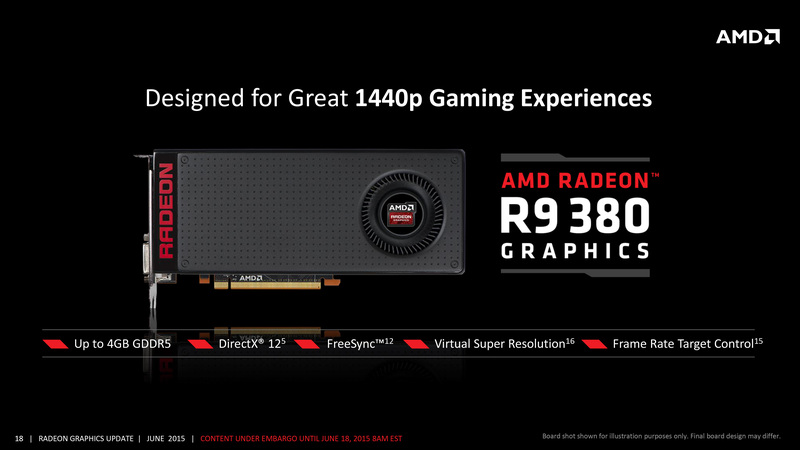 Finally, expect to see AMD pitch the R9 380 as a 1440p card. While we haven’t benchmarked this card yet, based on what we’ve seen with the R9 285, I’m expecting similar results. In which case like the R9 285, AMD is likely overshooting in their expectations. In 2015 Tonga is a good GPU for 1080p gaming, but even with 4GB I’m not sure the performance is there to keep 1440p with high quality settings playable over the next 2-3 years. Overall it’s interesting to note that of the first 3 300 series cards, all of them ended up being close (if not identical) to the 300 series OEM cards AMD quietly launched back at the start of May. The 360 and 370 are identical, whereas the retail 380 is clocked a bit higher relative to its OEM counterpart. So for anyone who was expecting the retail cards to be similar to the OEM cards, they were right in this case. Though the upside here at least is that the OEM cards don’t significantly deviate from the retail cards, which is a great relief given what we’ve seen in some of the previous generations. In any case, this means that the coexistence of the 200 and 300 series will be an odd one to begin with. Along with the generally lower pricing of the 200 series, you can find fully-enabled Pitcairn and Bonaire cards there that don’t yet exist in the 300 series lineup, so the relative performance of the two series is a bit of a mess for the moment. Wowsas! AMD hit a home run with the Fiji archictecture. FuryX will be unbelievable perfomance, very likely the fastest GPU in the world and that water cooling system is incredible. quiet and cool running. A little birdie had to have been whispering in nvidias ear about how amazing this card was going to be when they decided to launch their 980Ti so quickly. 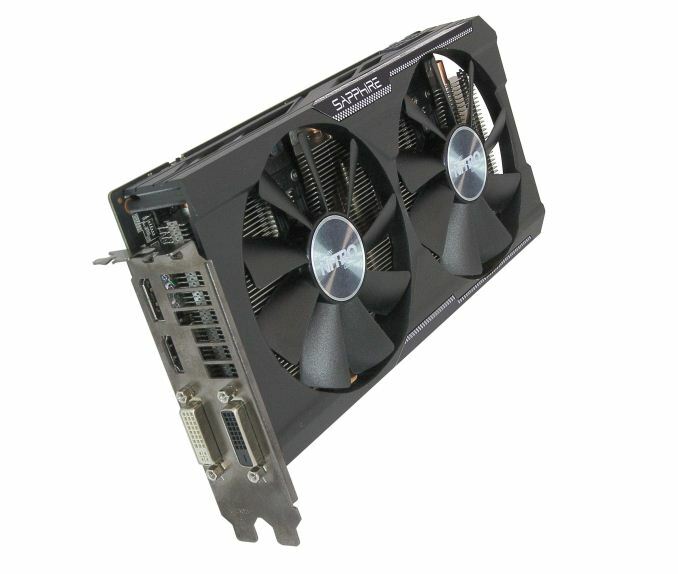 FuryX for 650 dollars may well leave the 980Ti in a questionable position. So far, all the benchmarks (yes, they're leaked, but logical) have shown Fury X to be as fast or faster than the 980Ti while being quieter and cooler thanks to its stock CLC. Also, you get the best version for overclocking for $649 out of the box, whereas you pay over $700 for the higher-end OC 980Ti models. Hopefully any reviews we get from AT will include stock/stock and OC/OC comparisons and then we'll know for sure. AMD didn't have day 1 drivers for Witcher 3 (and didn't have drivers for the next 3 weeks either) and all their GPUs had no problems with the game. W3 even performed spectacularly after the tessellation override improved performance at zero image quality loss.